The world of football is in a state of frenzy and panic after a seemingly horrendous call was made during the anticipated game between the Green Bay Packers and the Seattle Seahawks. The Seahawks ended up taking the victory, with a final score of 14-12, but many are blaming the Packers’ loss on an extremely sketchy, lousy decision made by the NFL referees. Now, players are thinking about lashing out, possibly even going on strike, to prove to the NFL that they need to figure out this refereeing slack-off soon — not only to preserve the quality of the game but the safety of their players. 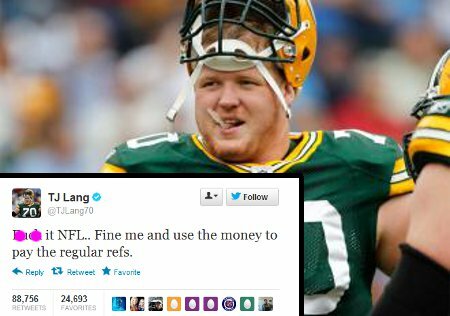 In a tweet that will now forever be remembered by the world of sports, TJ Lang said, “****It NFL. Fine me and use the money to pay the regular refs.” Many are claiming that this was the worst ref call in the history of the sport, and everyone is quite literally up in arms. On the plane ride home, the players discussed the nitty gritty details about what went down and how they should approached the issue next. Many are willing to go on strike. What do you think about this NFL controversy? Do you think players should go on strike until their voices are heard? Let us know in the comments section below!